Locust swarms attacked Naema Bay in Sharm al-Sheikh on Wednesday, sweeping through streets, restaurants and bazaars across the thriving tourist hotspot. The Shura Council’s economic committee deputy Abdel Halim al-Gammal has criticized authorities’ tardy reaction in dealing with the pests, which also attacked Saint Catherine and Ras Mohamed and threaten species across the southern Sinai Peninsula. Gammal also called for an emergency operation chamber, consisting of officials from the agriculture and environment ministries, to fend off the swarms. Sayyed Megahed, head of the Sharm al-Sheikh renters’ coalition, reported locusts spreading across Naema Bay. 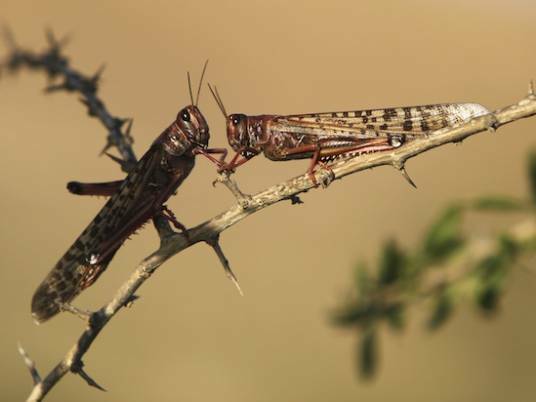 It marks the first time such large numbers of locusts have descended on Sharm al-Sheikh, he added.